Let Us Create You a Custom Entertainment Center Wall Unit! An entertainment center wall unit can be a beautiful addition to any living room or even a personal home theater. Busby Cabinets, as the business offering custom cabinets Orlando residents recommend, can provide you with the home entertainment center that you have always dreamed of. Simply trust us with your business and we can provide you with an entertainment center that is not only beautiful, but is exactly tailored to your needs. Contact us at Busby Cabinets in Orlando to learn more about how we could build the entertainment center you have always wanted. 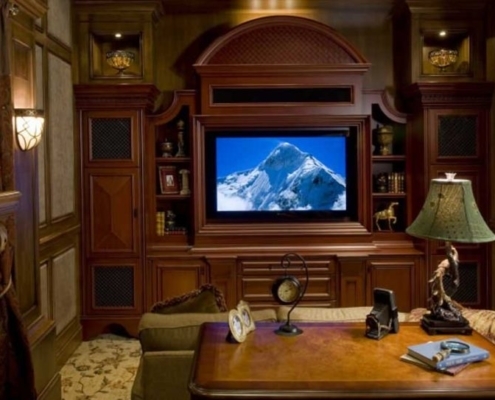 Would Your Family Benefit from an Entertainment Center Wall Unit? Any family of any size knows how incredible an entertainment center can be. Even the bachelor knows that the home entertainment center can provide the organization and storage that they need to house TV equipment as well as video games and any other sorts of decorations they may want. No two entertainment centers are exactly alike, and although two families may purchase the same mass-produced, plyboard entertainment center, they will likely have entirely different needs for it and the quality simply doesn’t compare to custom work. That is why a custom entertainment center wall unit is better suited for you and your family. With a custom entertainment center, you can explain exactly what your needs are, what your plans are for its storage and your designer will be able to build you one using those specifications. A wall unit in particular makes use of the space on the wall more efficiently than you would be able to get if you simply had a table for your television to sit on. This is because it gives you space to store all of the equipment that goes along with your TV and gives you a way to hide all of those ugly cables that may get in the way and tangle your little ones underfoot. Mass produced entertainment centers, however, are flimsy and cannot withstand the weight of all of that equipment. They are also more likely to suffer damage and get scratched than something built of real wood. Where Can You Get Exactly What You Want? If you would like to get an entertainment center wall unit, Busby Cabinets is the place to turn to. We can provide you with the custom cabinets Orlando residents recommend and tailor it to your precise needs for your entertainment center or home theater. Busby Cabinets is located in Orlando and our designers can provide you with the help that you need for your cabinet design purposes. Do not hesitate to contact us if you are interested in getting a new entertainment center. Busby Cabinets provides the custom cabinets Orlando residents trust. We are constantly striving to create the highest quality cabinetry that will not only look beautiful but will last a long time so that you do not have to worry about your cabinets not supporting all of your equipment. Contact us at Busby Cabinets to learn more about our products and see how we can build you a custom entertainment center.